By grrlscientist on October 26, 2008. For scientists, naturalists and birders, islands are the most amazing places on earth because their evolutionary legacy has provided them with their own fascinating flora and fauna that are found nowhere else in the world. But because humans also like to live on islands, along with their pets and crop plants, islands are a conservation nightmare, and certainly, the Hawai'ian islands are no exception. 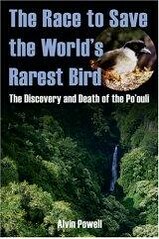 In Alvin Powell's book, The Race to Save the World's Rarest Bird: The Discovery and Death of the Po'ouli (Mechanicsburg, PA: Stackpole Books; 2008), we learn about one endangered Hawai'ian bird, the mysterious Po'ouli [poh oh OOO lee], Melamprosops phaeosoma, and the true story of why this enigmatic little bird disappeared forever. The book starts late in the afternoon of 26 July 1973, when botanist Betsy Harrison was climbing a steep trail at sixty-four hundered feet above sea level. She was alone. Suddenly, the dense forest came alive with the short chik calls and flitting movements of small group of Hawai'ian Honeycreepers. Accompanying the lively and vocal honeycreepers were three small, brownish birds with black masks, all of which were nearly completely silent. Silence is quite odd for the birds of the dense forests, since they must rely their voices instead of their vision to maintain contact with each other. Suddenly, Harrison realized she was seeing something very unusual, possibly something new. And thus begins the poignant tale of the enigmatic po'ouli, Melamprosops phaeosoma, a peculiar little snail-eating bird whose population was being savaged by a suite of invasive and deadly enemies that humans introduced onto the islands: domestic pigs and housecats, tree-climbing rats and mongooses, predatory snails competing for its food, malaria and of course, humans themselves. The tragic story of the Po'ouli exemplifies the multitudes of challenges associated with protecting and preserving endangered species in America. Interestingly, it was quickly realized that the PoÊ»ouli was special, unlike any of the other Hawai'ian Honeycreepers. DNA-based analysis revealed this unique bird represented an ancient lineage of honeycreepers, and -- unlike all other honeycreepers -- it was without any close relatives. Even though this is Powell's first book, it quickly becomes obvious to the reader that he is a gifted writer. Powell skillfully weaves together the story of the Po'ouli and the desperate attempts to save it from extinction into the complex tapestry of the history of the Hawai'ian islands, the damage wrought by introduced animals, various conservation methods, the human factors involved in saving endangered species as well as the federal Endangered Species Act and the vagueries of enforcement and government funding for preservation of those species this law was designed to protect. This gripping story is 280 pages long. It contains one map depicting the location of the Hanawi Natural Area Reserve on the island of Maui where the Po'ouli were found, and ends with 17 pages of endnotes filled with references for each chapter as well as a 5 page index. I highly recommend this well-researched book to all who wish to learn more about the practical challenges of conservation biology, to those who love birds and nature, fans of real-life science stories and to everyone who is fascinated by the Hawai'ian islands. Alvin Powell is the senior science writer for the Harvard University News Office. He earned a bachelor's in journalism from UConn and a master's in biology from Harvard. He has worked either as a freelance writer, a business reporter for a variety of newspapers or as a television news reporter, and has been a member of the New England Science Writers Association since 2007. This is his first book. Great review, GrrlScientist! I'll put this book on my mental list of books to read. I so appreciate you sharing this with us, GrrlScientist! I really hope more stuff comes your way that has to do with Hawaii! :) Mr. Powell should appreciate your sharing this as well!